One can’t help but wonder whether the power of the white powder of Sochi, the Russian resort of the 2014 Winter Olympics, has engendered positivity that has lacked in previous meetings. 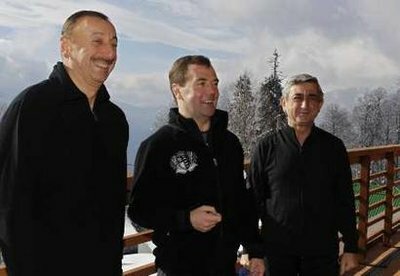 According to media reports, Azerbaijani president Aliyev joined the host, Russian president Medvedev, in skiing while Armenian president enjoyed snowmobiling. Not that either of the South Caucasus presidents need more partying, but partaking in joint recreational activities is seemingly a good way forward.